Melissa's home is a one story framed structure (originally a gas station) built in 1958 with many additions added on over the years. The latest remodel project was a new tile floor over multiple slabs that were part of earlier additions. 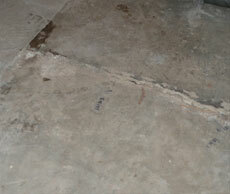 The joint between two slabs was experiencing differential movement, which would cause cracking in the new tile. 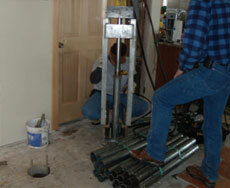 Foundation Repair of Western Colorado LLC installed two (2)Supportworks Slab Piers to stabilize the living room at the joint of the two pieces of concrete. The piers penetrated the soil below the slab for a distance of 16 and 17 1/2 feet respectively, developing a lifting force in excess of 8000 pounds per pier from the load bearing strata (bedrock), disallowing movement of either slab in that area. Installation of slab piers has stopped movement of the slab joint, allowing the home owner to safely install new tile in that area of the living room. 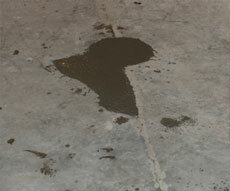 "Foundation Repair of Western Colorado was very knowledgeable about my problem. Fabulous customer service by all involved. A refreshing change from working with other contractors." - Melissa B.